US, 1949, 116 minutes, Black and white. Milton Berle, Virginia Mayo, Ruth Roman, Bert Lahr, Alan Hale, Jerome Cowan. To read Directed by Roy Del Ruth. 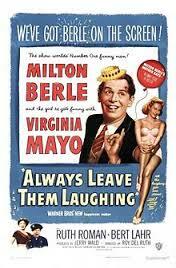 Always Leave Them Laughing is a star vehicle for Milton Berle who had been performing on stage and in film since the mid-1930s. While he made some films, including It’s a Mad, Mad, Mad World, television was his right place for many decades. He was extraordinary popular in the United States as well as outside. This is a story about a self-centred performer, Kip Cooper, trying to make his mark in vaudeville and burlesque, putting others down, tracking down agents and entrepreneurs, intruding, getting some breaks. With his admiration for the actor played by Bert Lahr (the cowardly lion of the Wizard of Oz), he gets an opportunity to understudy and perform in rehearsals out of town. However, the actor wants to perform but collapses during his act, which has a temporary effect on Cooper. In the supporting cast is Virginia Mayo as the actress who works with Bert Lahr, barely tolerates Kip Cooper and clashes with him. By contrast there is Ruth Roman as the would-be dancer, having an opportunity to dance, loving Cooper but experiencing being discarded and used by him. Appearing as the entrepreneur is Jerome Cowan who 12 years earlier had played a similar entrepreneur in New Faces of 1937. 1. The first half of the 20th century, entertainment, burlesque, vaudeville, radio, television? From the 1949 perspective? 2. Milton Berle, as a comedian, television personality, in film, his long career? Popularity in the US and beyond? 3. The title, the slogan for comedy? 4. Kip Cooper, his age, career up until this point, his hopes? Egoistic, determined, ruthless? His care for Fay yet betraying her? Nancy and competitiveness? Eddie, admiration, stand-in, doublecross? His character, repartee? Ultimate success on television? 5. His early performances, hogging the stage, his attitude towards the girls, flirtatious yet putting them down? The attraction to Fay, talking, meeting, family, her mother, possibilities for love? Her character, help, self-effacing, her ordinary life, work? 6. The world of agents, deals, Sam and his influence, producers and entrepreneurs, Elliot Montgomery, Kip intruding, his bravado? 7. Eddie Eagan, Bert Lahr and his reputation, burlesque and stage routines from the 20s, repeated in the film? Memories of The Wizard of Oz and the cowardly lion? The introduction to Kip, Kip’s admiration, Eddie and his collapse? Kip’s reaction, entering as stand-in, his work with Nancy, on stage, off-stage and the clashes? His self-importance? The rehearsals out of town, his use of Eddie’s routines and his own variation? Eddie and his recovery, wanting to go on, Kip’s self-centred reaction? Eddie and his performance, collapse, death? Kip’s reaction? Interviews? 8. The range of performances, specialty acts, old-time burlesque and routines? In the 1940s? In retrospect? 9. The meetings with Nancy, her aggressive attitude towards Kip, her relationship with Eddie, her own career? 10. The television job, Kip and the camera, the performances, the advertisements? The audience response? Fay, possibilities for the future? Would Kip ever change?